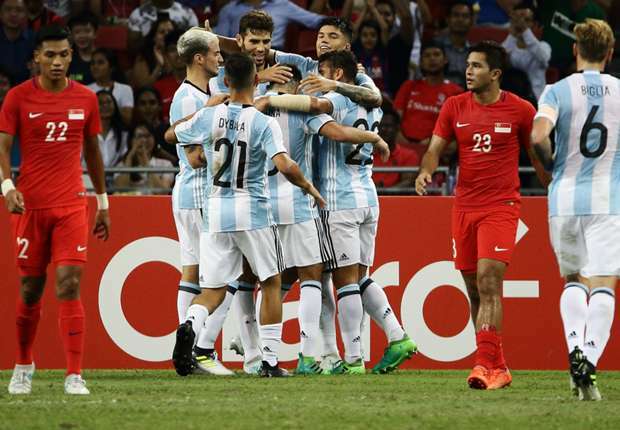 Argentina players celebrate Federico Fazio\'s goal against Singapore on Monday. Invited to commemorate the association's 125th anniversary, Argentina conducted a masterclass in the beautiful game against the Lions during Tuesday's (Jun 13) friendly, in which they put six without reply past the hapless Singapore defence. The Lions had been warned: New coach Jorge Sampaoli had indicated an intent to attack before the game, and he stayed true to his word, fielding a 2-3-5 formation led by stand-in captain Lucas Biglia. After a scrappy opening 20 minutes, the South Americans opened accounts through Federico Fazio - one of only two defenders on their team sheet. The 30-year-old Roma defender poked in from a corner in the 24th minute to give Argentina the lead. Barely five minutes later, Joaquin Correa doubled the lead, scoring his first international goal on the half-hour mark. With the Lions looking tired in the second half, Atalanta midfielder Alejandro Gomez scored a pile driver from outside the box after 60 minutes of play. To add salt to the Lions' wounds, a poor goal kick from substitute Singapore goalkeeper Izwan Mahmud allowed Leandro Paredes to dribble past Mustafic Fahrudin before shooting just past Izwan's fingers into the bottom corner. Forward Lucas Alario smashed the ball in the top corner in the 89th minute to make it 5-0, after he was teed up by Paris Saint-Germain star Angel Di Maria. Di Maria closed proceedings by cheekily dragging the ball into goal, making it 6-0, after receiving a square pass by Ignacio Fernandez. Although Juventus star Paulo Dybala did not score for Argentina, it was all too easy for the two-time World Cup champions, with Singapore barely getting a touch of the ball for most of the game. Despite the score, coach Sampaoli told media that the first half had not quite gone to plan for the Albicelestes. "The focus was to push in attack and it did not work out well in the first half. "But it translated well in the second half and I'm happy with their performance," said the former Sevilla head coach. The loss compounded the Lions' misery after the team suffered a morale-sapping 2-1 loss against Chinese Taipei in the Asian Cup qualifiers last Saturday. But Lions coach V Sundramoorthy lauded his team for their spirit and a solid defensive display in the opening half, despite superior opposition. "Technically you can see how superior they were ... rotating the ball around. So comfortable making penetrative passes. So it is a difficult line for us (to hold). We sat deep and tried to organise. Credit (must go) to the boys," said Sundram. "We conceded two goals from set plays in the first half. That is creditable to the boys because they were compact. We slept during the set plays and they scored," he added. "We were playing against one of the best teams in the world. The boys tried their best and they learnt a couple of lessons in this game. And let's move on to the next game." The Singapore national football team will next face hosts Turkmenistan in the Asian Cup qualifiers on Sep 5. La Albiceleste will take on rivals Uruguay in a key 2018 World Cup qualifier on Aug 31.